This weekend sees the final days of an installation, Dazzle at London’s V&A, centred around Wilfrid Gibson’s war poem Suspense. 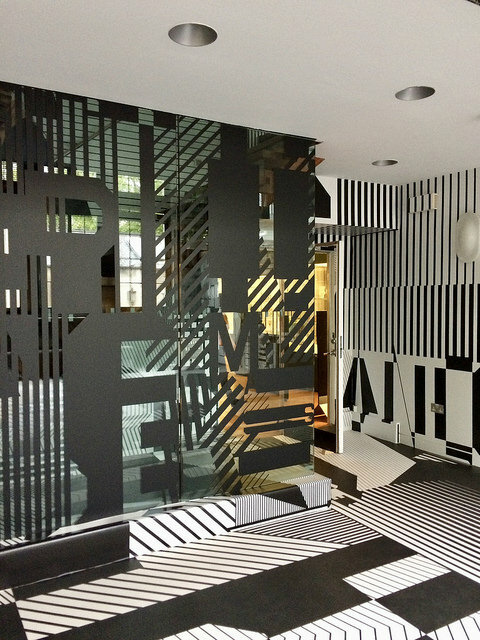 The installation is one of a series inspired by the use of ‘dazzle’ camouflage used to reduce the risks of submarine attacks on shipping in World War One. Suspense draws on Gibson’s own experience of crossing the Atlantic as a civilian passenger on a troop ship from New York to England in 1917, shortly after the USA joined the war, and shortly before he joined the army. And through primeval weedy forests sweep. And ooze of oceans of forgotten time. Unfortunately the information display in the V&A has a misprint in the poem – “guide” for “glide” in the seventh line. 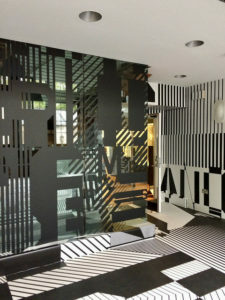 Nevertheless, it is an impressive installation – the “dazzle” is made up from the typography of the poem.